Seven Years in the Making, the FIRST EVER Palladium American Eagle! In 1986, the United States Mint debuted the landmark American Eagle series. Struck in both gold and silver, these two bullion coins ushered in an exciting new era. 11 years later, the U.S. Mint followed up on that phenomenal success with the introduction of the Platinum American Eagle. Through its consistently spectacular and expertly minted designs spread across three precious metals, the American Eagle series has established itself as one of the most premier bullion names on earth. However, no other precious metal has been minted under this prestigious name -- until now! In 2010, Congress authorized the production of a new American Eagle struck in palladium. A member of the platinum family of metals, this "noble metal" beautifully holds its own against the forces of tarnish and rust. Hypoallergenic by nature, coins struck in palladium repel corrosion and oxidation, staying the same color forever -- literally! After years of tests, studies and development, the United States Mint is releasing the very first Palladium Eagle for 2017. For a stellar year celebrating the U.S. Mint's 225th anniversary, this fantastic first is the icing on one amazing birthday cake! TWO CLASSIC WEINMAN DESIGNS!-- The first striking thing you'll discover about the Palladium Eagle is its breathtaking, yet familiar design. 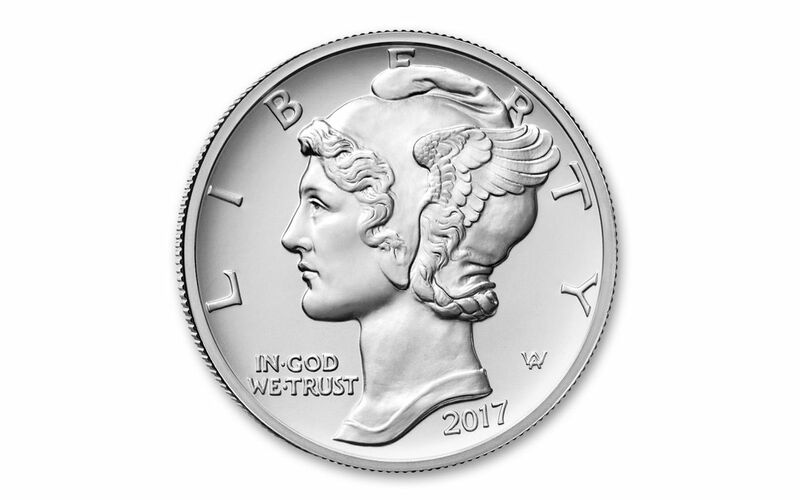 Adolph A. Weinman's classic Winged Liberty from the popular "Mercury Dime" series is reinvigorated on the obverse. Flip the coin over and you'll find another Weinman creation -- his design for the 1907 American Institute of Architects (AIA) Gold Medal. It's the first time this eagle design has ever appeared on a U.S. coin! A HIGH RELIEF FIRST!-- Before now, the United States Mint has only reserved their high relief artistry for coins struck in gold. 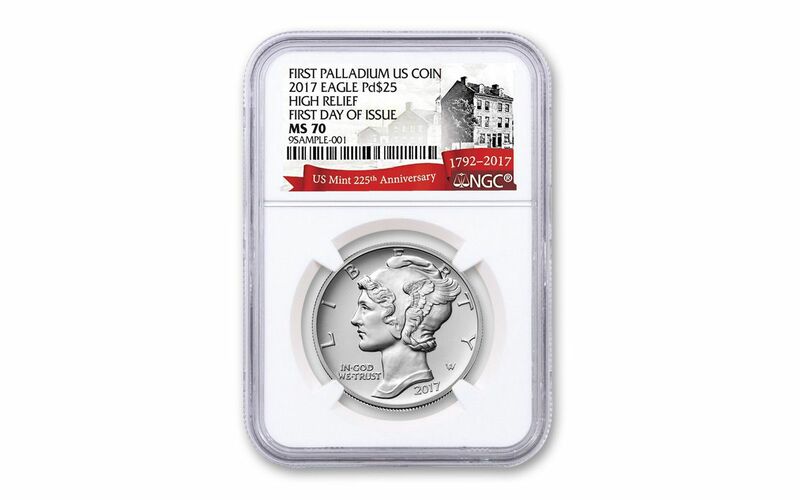 With both sides of this palladium coin struck in gorgeous high relief, this already historic coin can claim another monumental first as the U.S. Mint's premier non-gold bullion high-relief coin! HIGHLY PURE PALLADIUM-- Struck in Philadelphia, each 25 dollar United States legal-tender coin is minted in one ounce of 99.95% pure palladium. While you'll find proof of the coin's purity and face value on the reverse, you won't find a mintmark, keeping in line with other American Eagle series bullion coins. 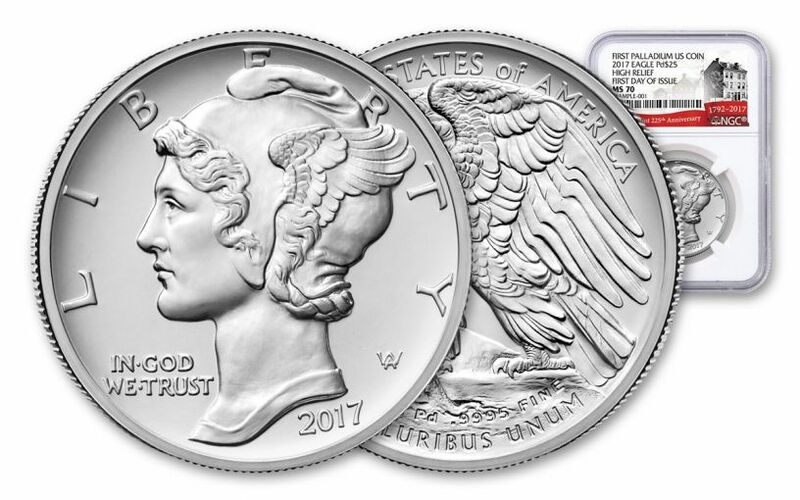 CERTIFIED FLAWLESS-- Your coin will also come certified Mint State-70 (MS70) by Numismatic Guaranty Corporation (NGC), a distinction that means your perfectly-graded 2017 1-oz Palladium Eagle will have ZERO imperfections -- showing all features and fields exactly as the engraver and mint intended! In addition, your Palladium Eagle will be certified First Day of Issue (FDI) by NGC-- independent authentication that your coin was released by the mint during the premier day of the series' issue. Finally, your coin will be sonically sealed in an acrylic case with a special 225th anniversary label, giving you the best in protection while granting clear sightlines into every beautiful detail. A SIGNIFICANT COLLECTOR EVENT! -- Initial production numbers have set this debut's mintage at 15,000. While the U.S. Mint is anticipating high demand, we're projecting a tremendous rush of international collectors looking to secure these Palladium Eagles for their own! These Palladium Eagles are NOT available through the U.S. Mint website or at any of their office locations. GovMint.com is part of the U.S. Mint's Authorized Purchaser network, so you have an "in" with us! Whether you have first-year Gold, Silver and Platinum Eagles or are just starting your collection, if you want to bring a bit of palladium to your stack or want to be a part of numismatic history, this is your chance! 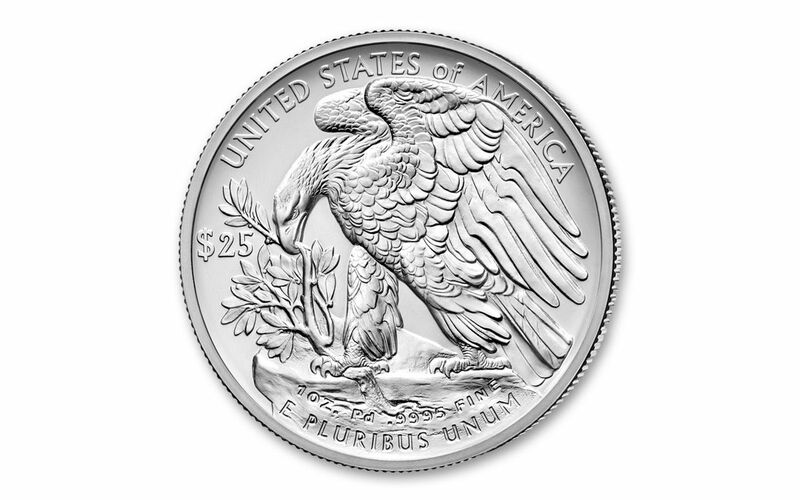 Order your 2017 1-oz Palladium Eagle now!